The life sciences comprise numerous disciplines; these study physiology, anatomy, behavior, development, evolution, ecology and disorders of living organisms as well as the use of organisms in natural or technical procedures. Life sciences include biology, biomedical research and pharmaceutics, biochemistry, biophysics, bioinformatics, agricultural and nutritional science as well as food technologies, bio-based economy and the use of biogenic resources. The life sciences contribute not only to our understanding of basic mechanisms of living organisms and ecological systems; new research opens up novel possibilities to elucidate and treat human diseases as well as securing food for a growing world population. 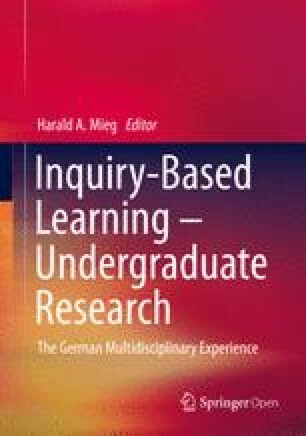 The term research-based learning is used here throughout to describe what is subsumed under undergraduate research experience (URE) in English speaking countries. In the German academic culture, research-based learning aims at a high level of self-dependence on the part of the student. The authors are coordinators of a research-based learning project for undergraduates, “Humboldt reloaded – Wissenschaftspraxis von Anfang an” (“Humboldt reloaded – scientific practice right from the start”) at the University of Hohenheim in Stuttgart, Germany (www.uhoh.de/humboldt-reloaded). They actively participate in research and teaching at the Schools of Natural and Agricultural Sciences. Brewer, C.A./Smith, D. (2011). Vision and change in undergraduate biology education – A call to action. American Association for the Advancement of Science. Retrieved 26 May 2015 from http://visionandchange.org/finalreport. Multrus, F. (2012). Forschung und Praxis im Studium. Befunde aus Studierendensurvey und Studienqualitätsmonitor (S. 14–15). Konstanzer Online-Publikations-System (KOPS) URI: http://nbn-resolving.de/urn:nbn:de:bsz:352-222461.